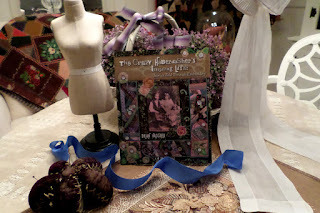 One of my embroidery friends from C&T Publishing told me about her new book and it's so cool that it's given me me a reason to wipe the cobwebs off my blog and share my thoughts about her new book, Beaded Embroidery Stitching. I have been a longtime admirer of Christen Brown's work and it's my great pleasure to introduce her. Anyone comparing our work would certainly not confuse the two, but Christen's perspective is inspiring and gives me plenty of food for thought. I do feel that we're kindred spirits in our exploration of crazy-quilting and embroidery. 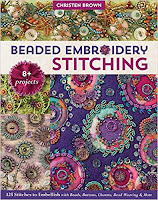 Do take a minute to write a comment on my blog to let Christen know how much you love it, and I will send one lucky winner an eBook copy of Beaded Embroidery Stitching on Monday, April 15. So please take a look at Christen's new book and congratulate her on this great work! I'm back! And brought a new book with me! What can I say other than life gets in the way? We have finally moved into our new place, we are set up, and I am working again! And, in the pages of this brand new book you can see the results! An opportunity came to me two years ago from a wonderful company known as Quiltmania. They first photographed the studio for an issue of their magazine which was distributed worldwide. Because of the interest in that article, they proposed publishing an inspirational book. The first half of the book is the story of my development as an artist and my life's work--from a young age until current day. 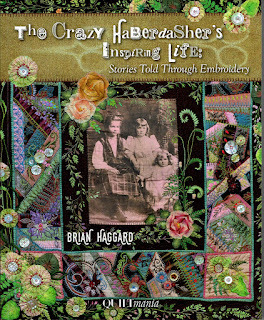 It's a full color book showing the life and times of a Crazy Haberdasher otherwise known as Brian Haggard. Inside the pages you'll see the daily life of an artist living in a warehouse space, i.e. polebarns with concrete floors--but they've never looked so good! The studio space is Shabby Chic on natural concrete floors featuring "many items of curiosity." The monochromatic cream colored guest room highlights a crazy quilt collection which is the only color introduced into the space. The adjacent private quarters is classic Rococo with a twist of eclectic style. The decor is a amalgamation of all of my loves: interior design, florals and needle arts. Living in this unconventional way is very natural to my partner and I. 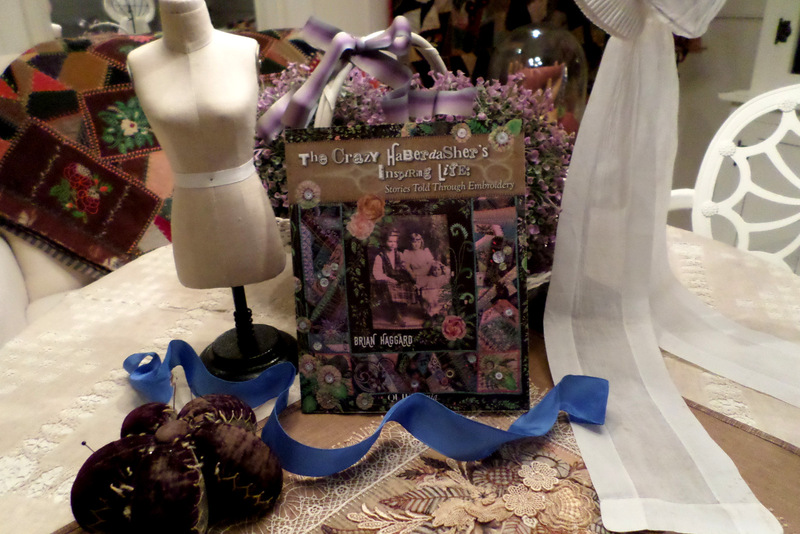 The remainder of the book features 29 previously unpublished works featuring many techniques including piecing, quilting, english paper piecing, felt applique, unique embroidery styles, photo imaging and a variety of antiquities applied in a variety of ways. There are quilts, totes, pincushions, wall pockets, shadow boxes. There are also three projects: The Heartfelt Etui, Make-do Pincushion and Pat's Big Heart. Finally, there is a glossary of 13 embroidery stitches. If you are interested in a signed copy click the image below to go to my online store. Each page is artfully designed with French and English text, easy for the reader to enjoy! 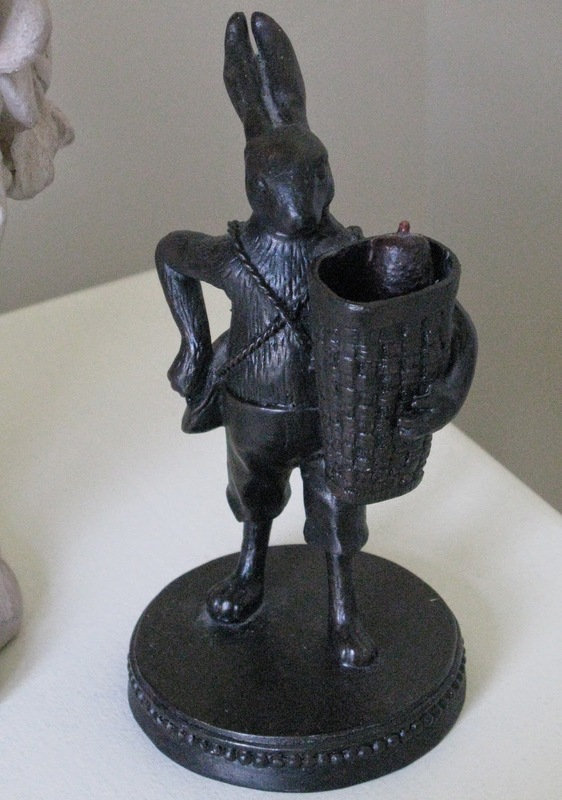 This is an antiquing find that had to come home with me the other day. Just wanted to share with you his very radical make over. 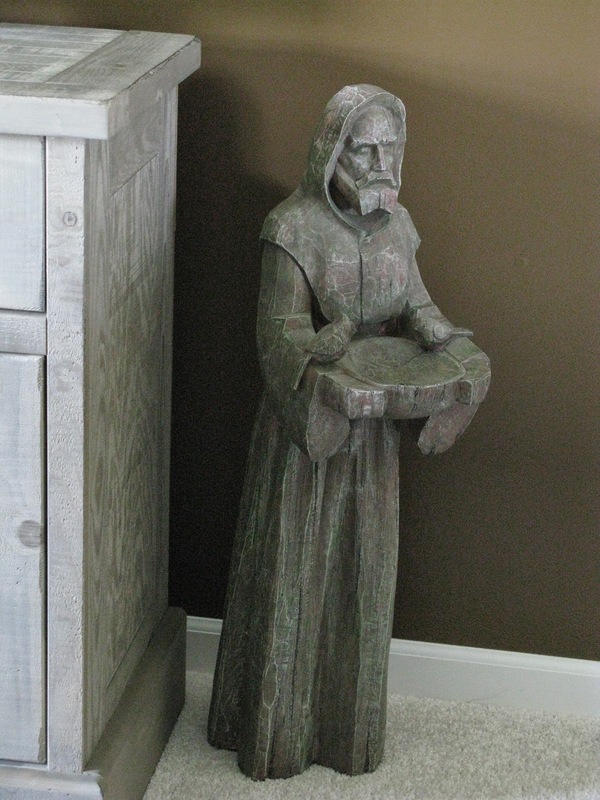 Here is a full picture of him before he found some new paint, the very sad thing is there is a place on the bottom of him that said the ladies name for which he was carved. the next thing is the mans name that carved it for her and that she was from Fort Wayne IN for Christmas. I hope you feel I am am going to do him justice. Well here is the start of what I am working on I am so very excited to see if he is going to have the vibe that I am wanting. The term dappled is for the horses of old that pull at your nostalgic heart strings. I will be sure to send you some updates soon to get a look at the new and exciting make over, I hope you are liking where this is heading because I sure do. Can't wait to share what I have up my sleeve. I hope you all are having a wonderful summer! Mine has been a busy but productive one and now here we are with Labor Day just around the corner. I wanted to slow down and take a little time to share some pictures and experiences that I had on my amazing Irish adventure back in June. We were there for ten fascinating days, each one was filled to the brim with beautiful settings, interesting people and marvelous sites. Me, being the visual person that I am, tried hard to capture every morsel of the beauty. That is why I ended up with more than two thousand pictures by the time I returned! I would like to share some of my favorites with you. The flight was long and we arrived worn out but excited. The first night we wanted nothing more than a soft bed to fall into but after a restful night we were all raring to go. Our group was organized through Sew Many Places, a travel group that caters to people with interests in all types of textile arts. I acted as one of the two hosts for our group, the other was the spectacularly talented, Pam Holland. Luckily for us the people in our delightful group made our jobs easy. It was truly a pleasure to share this holiday with each and every one of them. 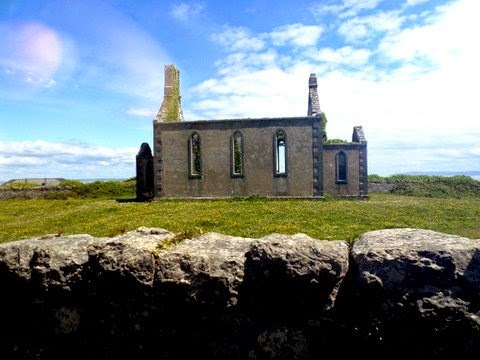 enjoying the beauty of Aran Island. Our coach driver, a fact filled and fun guide that helped us along our way was D.B. He explained to us how he came by his unusual name. The initials stand for "Darling Boy" a name given to him by his mother. He explained much of the Irish history and customs of the areas we visited and he regaled us with stories and information about this beautiful green country. Our first day out we hopped on a ferry that delivered us to Inishmore, which is the largest of the Aran Islands off the coast of Galway Bay in south west Ireland. the island. Look at the size of this pony's feet! 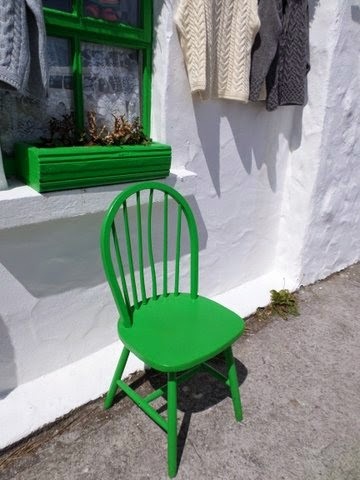 The people living on Aran Island speak both Irish and English and are passionate about preserving the traditions of Ireland. 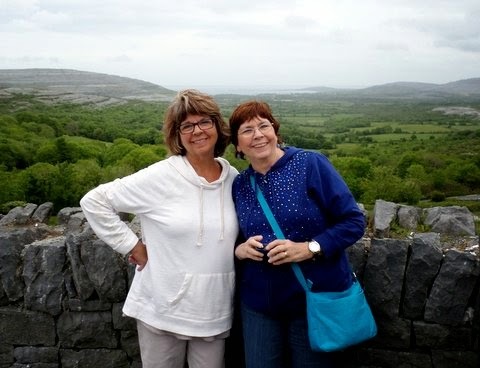 They were all so welcoming and warm they made our day on Aran Island very special. with cheerful colors use for trim. These is the samples of what we made. Everyone made a beautiful memento of their time in Ireland. 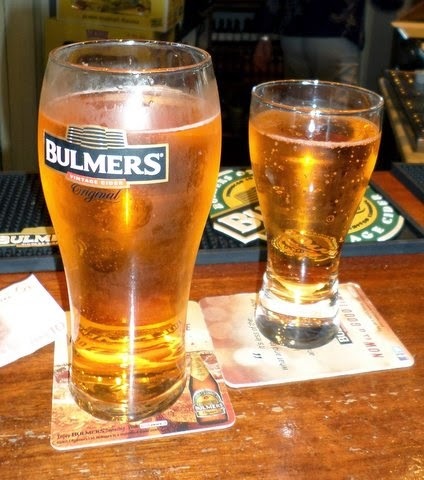 ...and what could be better at the end of a wonderful afternoon than relaxing with a bitey pint of hard cider. Wonderful! I wish I could tell you how good this tasted! 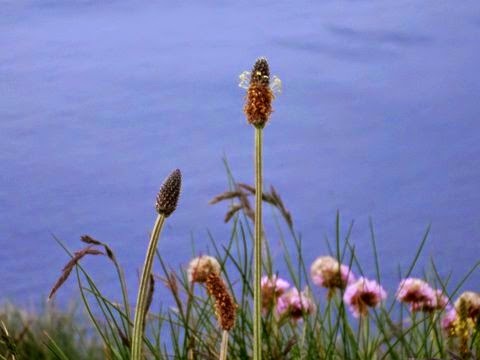 On Friday and Saturday our days were filled with new sights, smells, tastes and sounds as we visited the Connemara marble shop, the Celtic Crystal factory and for me, one of the highlights of the trip Kylemore Abby and gardens. We made and, YUM! ate scones and watched as a resisting sheep lost its wooly coat. I will share those memories in my next post. I have so much more to share about our time in Ireland but will close this blog for now. I promise to post again soon with more pictures and thoughts about our trip. Let me know what wonderful adventures you have had this summer and until next time be creative and have fun! Come Join Me in the Caribbean! The Ireland trip was everything I had hoped it would be and more. I have lots to share with you about our adventures. Right now I am busy playing catch-up! 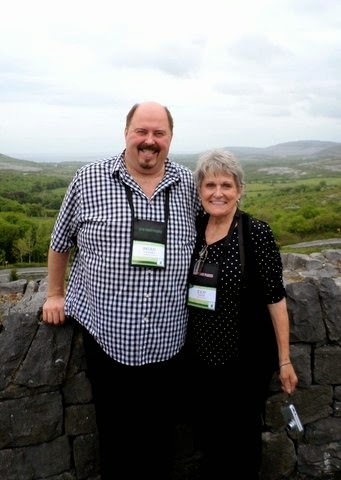 I will post shortly about our fabulous trip to Ireland. I did want to get this information to you ASAP, though. 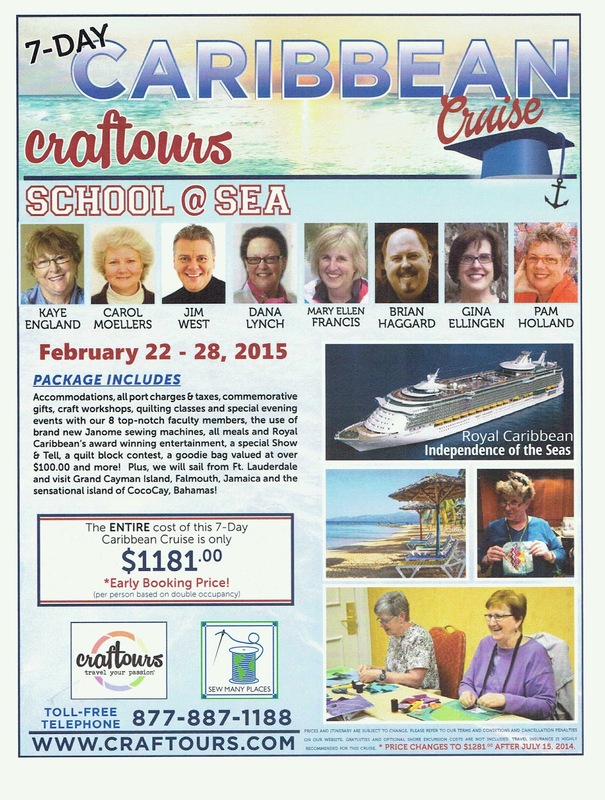 Next February I will be one of the hosts and teachers on a seven day Caribbean cruise. It is a wonderful opportunity to take classes from some of the best in the business and I would love for you to join us. It's a win-win! Get out of winter's frosty grip and enjoy the sun, sand and blue waters of the Caribbean while immersing yourself in your favorite passion! Here is all of the pertinent information about the cruise. Recently, the kind ladies at Back Door Quilts gave us all an opportunity to experience a bit of the Downton Abbey magic. 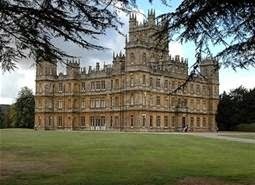 They hosted a lovely tea that Lady Grantham would have been proud to attend. They also invited us to step back in time and come dressed in vintage styles popular at the turn of the century and worn by the characters of the PBS hit series, Downton Abbey. Door, since I was eleven. We won't discuss how many years that has been. Let’s just say, a lot! They have always been so supportive and they gave me one of my first teaching jobs at the tender age of sixteen. Downton Abbey fabrics. They have become so popular! I wanted to reflect a vintage feel while making this piece. My choices of stitches,trims and buttons emphasized that style. If you want to see more of the Downton Abbey inspired fabrics ,the full line is available at the Back Door . gentlewomen had such elegance and grace. Their homes and lifestyle were on such a grand scale, I find it fascinating. true antique pieces out of grandma's cedar chest, to complete their looks. It was enjoyable wandering through times gone by for just a little while, and bringing a little of the Downton Abbey elegance to Indy. Much thanks to Linda and Teri for providing such a charming backdrop! Right now, I am hard at work preparing for my trip to Ireland. For those of you joining me on this journey, see you very soon. Not to worry if you aren't making the trip though, I will be posting tale of our adventures upon my return. Today, I would like to share a project with you that has been a “labor of love” for me. Since my main focus on the blog has been about quilting and fabric design, some of you may not know that I am also an interior decorator. 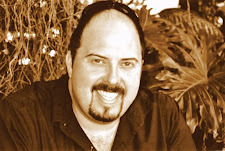 Over the past eighteen years I have had the pleasure of working with many wonderful clients. 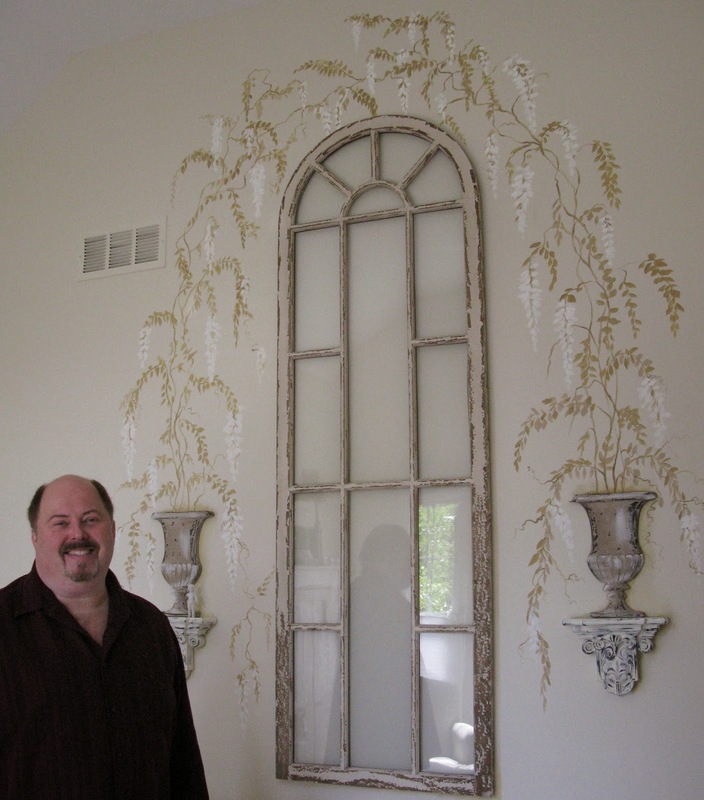 It has been gratifying for me to help them realize their vision of what will make their homes beautiful and unique. Recently, I had the happy opportunity to be able to do this for my parents, in their new home. Their dream home has lots of room with high ceilings and plenty of gathering space for the family. Oh, and a big garage for my dad. My parents, Richard and Debbie Haggard are pictured below. They are an energetic pair that, are always going and doing. Mom likes to shop and Dad likes to take her and wait patiently while she looks. They are both very artistic, so I guess the apple didn't fall far from the trees. Here they are in their new living room. I selected black for the walls in this room because I knew it would make the white wainscotting pop. 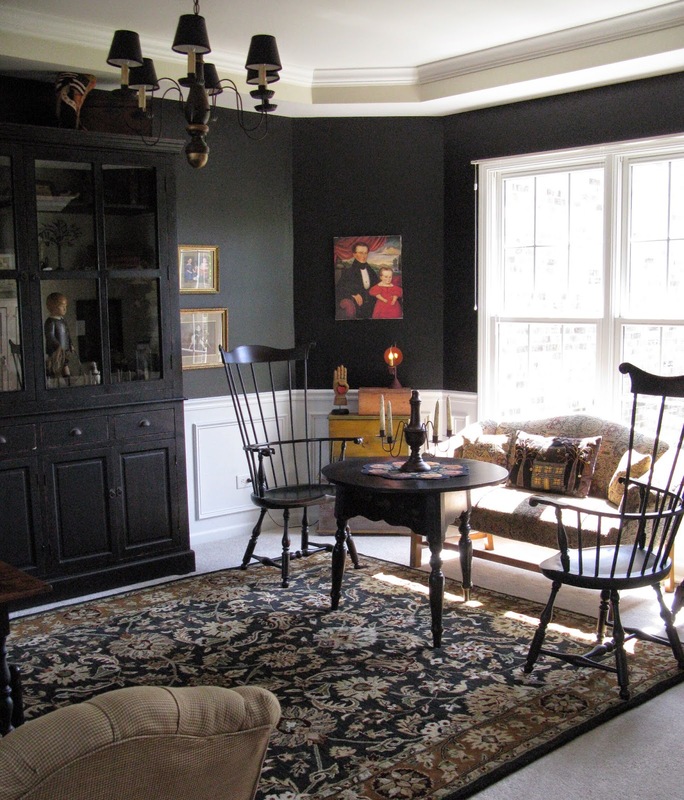 The black also goes well with the colonial furnishings. The color worked even better than I had hoped. resemble an old early american tavern. 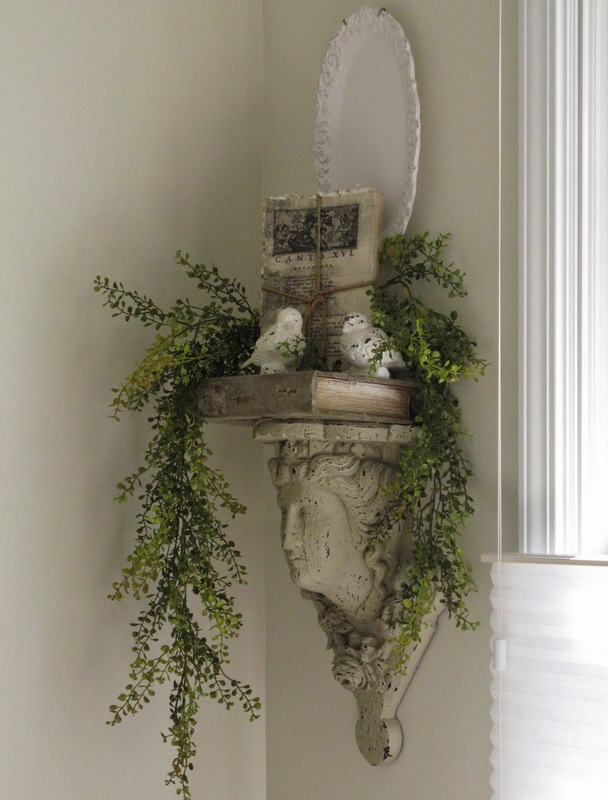 Over the years, my parents have collected many wonderful antiques and interesting pieces. One of my biggest challenges has been deciding which pieces from the treasure trove of goodies, I would use in my design. This was difficult at times because I have fond memories of so many of them. 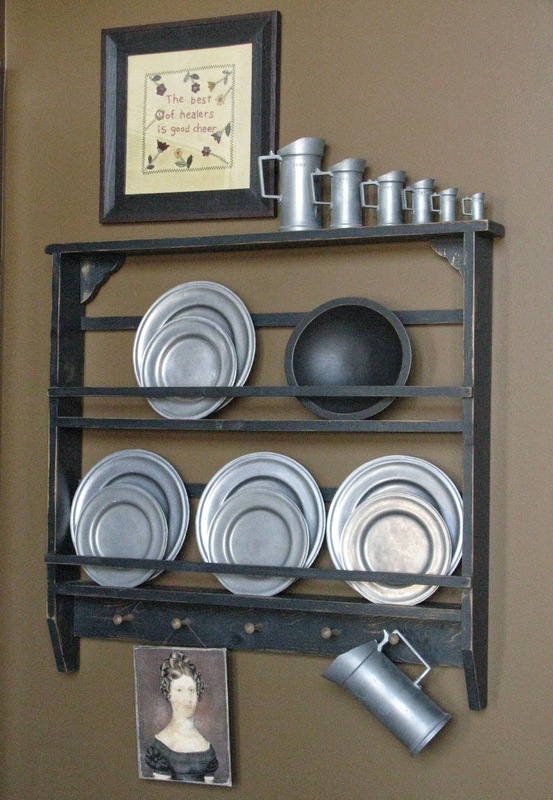 My parents like the authentic colonial style and lean towards that when decorating. My mother also has a very soft spot in her heart for the white-on-cream shabby chic look, so I tried hard to combine the two. We found this wonderful old window and decided to hang it in what Mom calls her sun room. 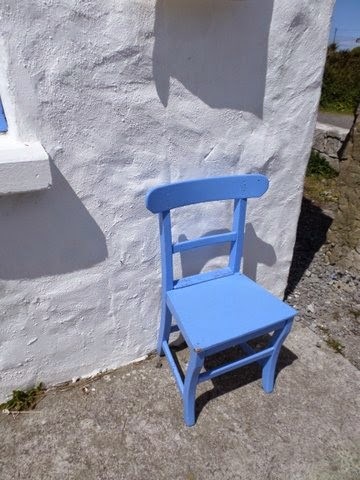 It is a small sitting room in the front of the house and does get very sunny. 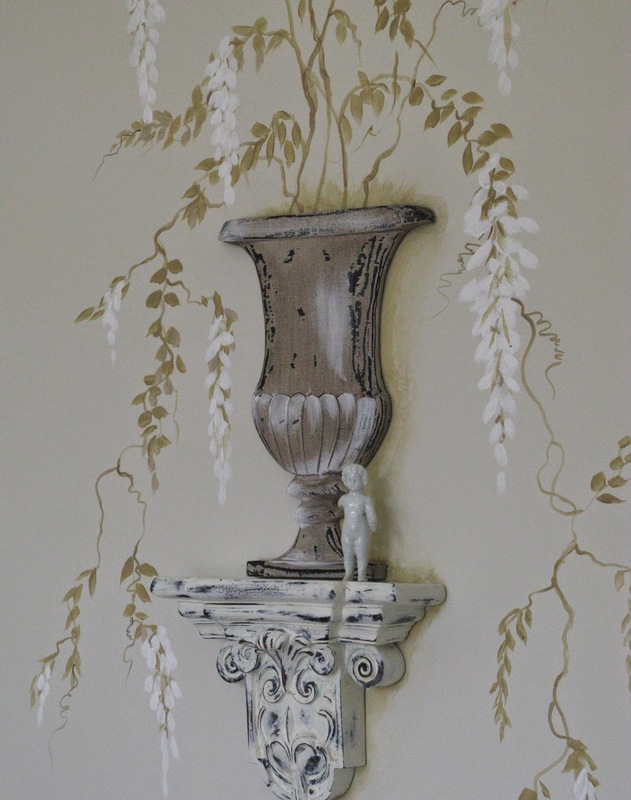 I added some interest with the mural and urns. We designed this room in the Shabby Chic she loves so much. Below are some other design elements of the room. The pretty lady on the right of this picture is my Mom and some of you probably recognize the sweet lady on her left. That is my able assistant, Jody Baker. Jody keeps me organized on the road and is a talented fabric artist herself. She is also a close family friend and loves spending time with my folks. You never know what these two might be getting up to next! I added a few pops of color to this shabby chic parlor, but the furnishings still hold true to the colonial style that suits this gathering spot so well. I wanted to showcase the high ceilings and sunny openness of this room without losing any of the coziness. This little niche was the perfect place to put one of my mom's favorite paintings. My dad picked one of the big rooms upstairs, as his lounging, TV watching, napping, work room. 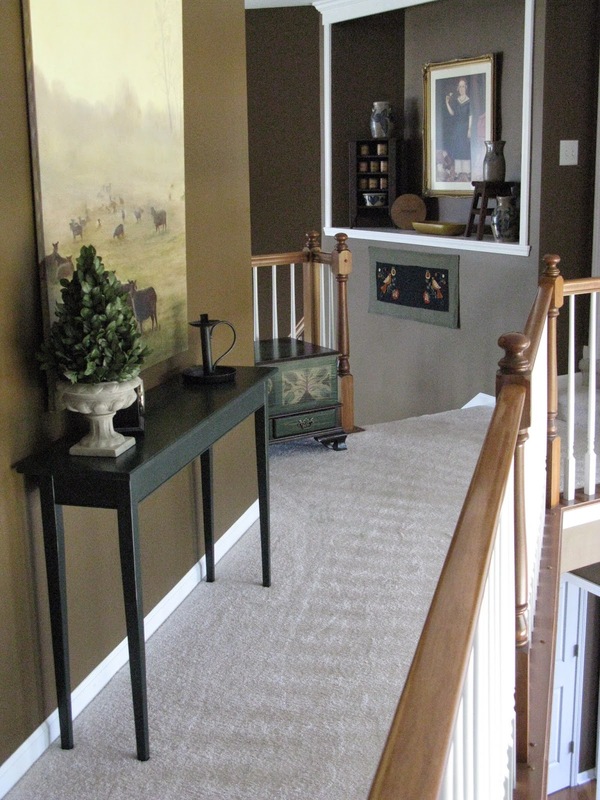 We carried the color, as well as the heavy pieces of furniture up the stairs and down the hall to his more masculine but still colonial style room. Dad's desk. Yes, those legs are made of cast iron. Yes, these units were VERY heavy! This wall was bit of a problem area because of it's width and placement in the room. 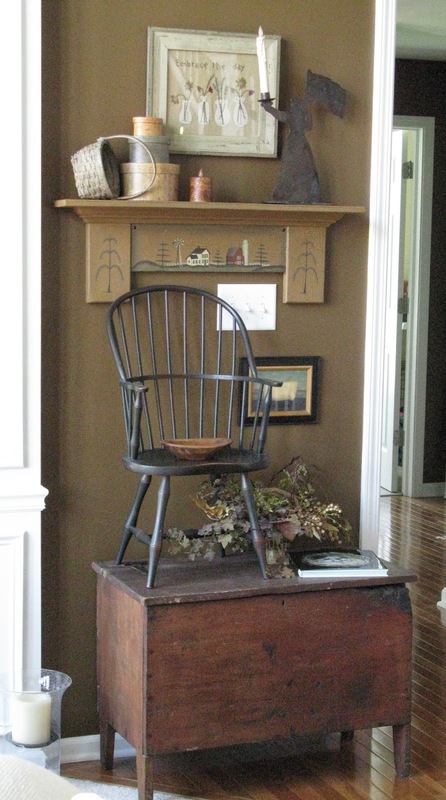 I worked around this by using a small antique chest and added height by going up from there. 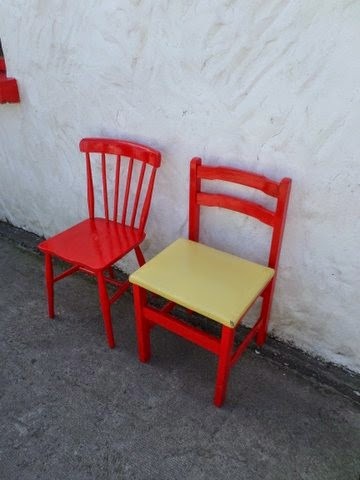 Isn't the small Windsor chair adorable! Well, I guess that's all of the tour for now. Like most things, this is still a work in progress. We haven't even begun to work on the fireplace and we need to find a great place to put all of mom's antique dolls! I hope you have enjoyed seeing my folks new home as much as I have enjoyed helping create it and sharing it with you. Wishing them many years of health and happiness in their beautiful new home. Have you performed any "labors of love" lately? Tell me all about it!